The University of Debrecen is one of the most prestigious universities in Hungary. The roots of higher education in Debrecen go all the way back to the 16th century. Debrecen is a spot for numerous cultural and gastronomic festivals, such as Debrecen Flower Festival, Hajdúság Carnival, and Debrecen Spring Festival. Leisure life is enriched by the active sport life of the city: Debrecen has been hosting a number of national and international sports events, from national championships to European and World championships. 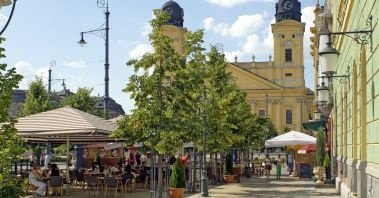 Debrecen is one of the most vivid and friendly cities in Hungary: this city has a unique combination of a dynamic cultural and intellectual heritage and of an effective and successful modern way of life. Education began at the four faculties in September 1914. The Faculty of Medicine was the first to receive an independent site, when, during World War I, the construction of the university hospital began on a secluded, wooded ground of 116 hectares. There were almost a thousand people working at the site. Charles IV, the last king of Hungary, opened the main building of the medical school in 1918, and the medical campus was completed in 1927. The new high-rise building, which houses departments of theoretical medicine, was erected in 1973. The university now offers complete English language studies in General Medicine, Pharmacy, Dentistry and Physiotherapy, as well as Natural Sciences. The University of Debrecen is one of Hungary’s five elite-research universities, offering the widest choice of majors in the country for over 29,000 students, including 3,741 international students. The Medical School hosts one of the largest hospitals in Hungary with 18 clinical departments and more than 1,800 beds. It is not only the best equipped institution in the area, but also represents the most important healthcare facility for day-to-day medical care in the region. Please note that after the Debrecen exam you will need to pay a deposit within a few days of receiving an offer, in order to secure your place on the course. Students are accepted upon successfully completing an entrance exam and interview. To be able to sit the entrance examination students should have completed A Levels (or equivalent) and should ideally have grade C’s or above in at least two science subjects from Biology, Chemistry and Physics. Biology is compulsory. For those who do not meet this criteria the Medical Foundation year is available (see separate information sheet for full details). If unsure that you meet the requirement please contact us to check. There are two separate papers in the entrance exam of choice’ e.g. Biology and Chemistry, Physics & Chemistry, Chemistry & Physics. The duration of each exam is one hour. The oral exam lasts 20-30 minutes. Biology is a compulsory topic and the student can chose the second topic.